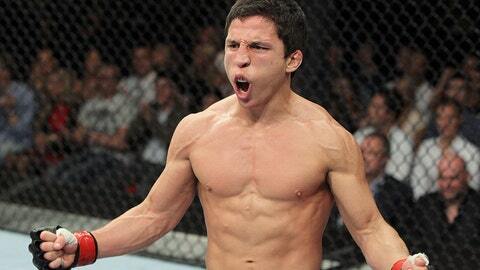 Joseph Benavidez came on the UFC World Podcast and staked his claim as #1 flyweight. On this week’s UFC World podcast, UFC flyweight Joseph Benavidez describes "an amazing end to the year" and that he is the happiest he has ever been as a fighter, going into his fourth fight on 2013, and not having had four fights in a year since 2008. Benavidez reveals he has been fine tuning and adjusting his game rather than changing it completely. He also believes that there will be major differences between Saturday’s fight the the last time he fought Johnson, for the inaugural UFC flyweight crown. "I wasn’t half the fighter I am now in that first fight," he tells UFC World podcast host Gareth A Davies. Back then, Benavidez reveals he "didn’t have a coach, game plan, or mental planning." What a change under Duane Ludwig. Jon Anik, meanwhile, describes in detail the experience of calling Hunt-Bigfoot blow by blow in Brisbane, and how he and Kenny Florian found themselves literally ‘lost for words’ at times during the epic back and forth battle. But it was still another silky commentary from the Anik-Florian duo.